Due to the amount of leather types we use, along with all the colors and color names there can often be confusion on which leather is which. So we've put together this quick reference to help you make a better decision in your purchase. Natural or Veg Tan (no dye) / Patina? Note: We only use cowhide for all of our leathers, with the exception of Horween's Shell Cordovan horsehide. Care Tips: Natural leather takes on stains and markings very easily, which adds to the patina look many folks enjoy. Stains easily from water or other liquids, as well as takes on dye from some clothing or dirt from hands. Keep well conditioned with any leather conditioner. Natural leather will tan in sunlight and turn a rich caramel color. Keep away from moisture, and prevent it from getting wet. Natural Veg is very near and dear to our hearts here at Craft and Lore. "Natural" refers to it not having any color added, and "Vegetable Tan" means it was tanned with bark tannin (wiki). It is essentially the "classic" barebones leather, tanned in the old world method of using environmentally friendly bark extracts in the traditional manner as opposed to chemical tanning which is quickly done and highly regulated by the EPA due to the toxicity of the leftover chemicals that must then be disposed of. Veg tan takes longer to create, and is famous for the extraordinary "patina" that will develop. Shown here is the exact same natural veg tan Port Wallet in new condition and the left wallet after being worn for several months. The term "Natural" means that there was no dye introduced during the tanning process. This means the leather is a blank slate and ready to take on the color and patina that you the artist will give to it. Each coloration and marking is a story and a post marker of your time together with this crafted item. It will tan to a beautiful caramel color if it is given enough sunshine, and it'll develop tan lines as well. The wallet truly ages and changes just as you do. After several years, you'll be able to identify any marks such as a coffee drop, or pen marking, or a careless drop into a dirty liquid that left its permanent mark on your wallet. We like to encourage people to not be terrified of getting the wallet dirty, or it taking a marking that most would consider undesirable. In fact, check out this well loved Enfold Wallet that was even featured at Heddel's "Fade of the Day" for all of the fans of denim and leather patina. Veg Tan that is no longer natural or "without coloring". Care Tips: Keep well conditioned with any leather conditioner. Expect darkening of the color and patina as it is worn in. Expect the dye to bleed onto articles of clothing during the first couple months of carrying. This leather will still take on marks and stains, but it isn't as visible after it has been dyed a darker color. Keep away from moisture, and prevent it from getting wet. Hand dyed products require extra time and attention from us, so there's an added cost to it. We also put a coat of our Leather Balm on the product, to help product the goods as well as slightly reduce crocking. Beware of Crocking! - Hand dyed products may possibly rub trace amounts of dye off onto clothes or other cloth items during the break in period. This is called "crocking". So be careful you don't have any light colored clothing coming into constant contact with a hand dyed product, until the break in period is complete and the crocking stops. Inside of a pocket is fine since it won't be seen. But some things have their edges dyed, like the Key Kedge which is in contact with the outside of clothes, or the dyed edge of the dark brown Mountain Belt may transfer if you wear a light colored pant. Here's a few products that we offer Hand Dye on. Harness Leather: a strong pliable oil-finished leather made from cattle hides. Hot stuffed with protective tallow, and fiber strength being the top priority. Care Tips: Should require very little conditioning to keep it oiled since it is a waxy leather, but conditioning will be good for restoring the uniform look of the item. Can withstand moisture and repel light water. Avoid soaking as you would with any leather item. We do love the fine folks at Wickett and Craig in Pennsylvania. Great American quality leather, and they're helpful to small brands such as us. Their Traditional Harness leather is one of our favorites from them, and we generally stock it in Buck Brown and Black. Things to know about W&C Harness are that it is excellent for it's tensile strength, and weather resistance. The waxes and oils it is stuffed with help prevent liquids and dust from penetrating inside of the fibers, and keep the leather lasting well and looking good. While it can receive cosmetic surface scratches, a bit of conditioner and a buff can clean it right up again. I generally put spit on my thumb and rub it in a circiluar motion to fix up a single marking quickly. The darling leather of the Horween Tannery. Combination tanned veg and chromium. We stock this leather only Natural colored Cowhide. Care Tips: Should require little to no conditioning due to the extreme amount of tallow infused in this unique leather. Repels water and elements very well. Avoid soaking as you would with any leather item. Chromexcel (or CXL) is one of the oldest of Horween's leather types. Old man Horween put together the formula for this fine leather back in 1913. It is a combination of both vegetable tanning and chromium tanning. The end result is a buttery smooth, semi-supple, waxy surfaced leather unlike any other out there. There's a good reason it has a bit of a cult following. For more on the history, process and some rich photos you'll want to give this Horween Chromexcel article a read. We only stock Chromexcel in it's "Natural" color. 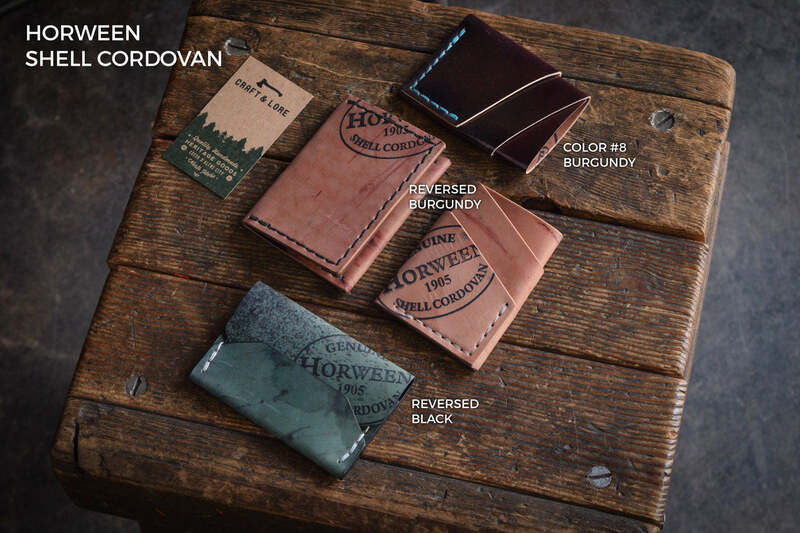 By "Natural" Horween is letting you know that no dye was added into the making of this leather. It receives this color from the tallow and tree bark extracts that they use to tan the leather. Features "pull-up", which is the ability to push the color around with the oils of the leather, only to have it slowly return to an even color over time. Horween's waxy full grain supple veg tan that is hard to believe is actually a veg tan. Care Tips: Should require little conditioning due to the amount of tallow infused in this unique leather. Repels water and elements decently. Always avoid water and soaking as you would with any leather item. Probably our biggest seller in terms of Horween leather, the Dublin in their English Tan color turns heads. It is a "pull-up" leather, just like Chromexcel and has the ability to have the dye pushed around under stress, only to have it return over time. This video below shows our Horween Port Wallet being built with Horween's Dublin English Tan. Notice how the leather color reacts when pressure is applied. That is the "Pull-up" effect of high end leather. Essentially a more rusticated looking Dublin. Horween's Derby leather is also a full grain vegetable tanned leather, nearly identical to Dublin except for that it has been tumbled giving it a well worn look and feel. It has an authentic vintage effect about it, as well as the pull-up distressed throughout the hide from the tumbling process. A very beautiful leather, but also tends to be an inconsistent one from the Horween tannery. We do love it, but tend to only stock in on occasion. Built for abuse, bridle leather stands up decently in the elements and is tanned for tensile strength. Care Tips: Expect darkening and a patina with time and wear in. Bridle leather can absorb moisture and water as it is only slightly tallow infused, which gives it a dry feeling surface. But it can dry and recover moderately well. Try to avoid water and soaking as you would with any leather item. We're currently stocking 2 leather colors in bridle and they are London Tan and the Dark Brown. Bridle leather is stuffed with wax and oil (tallow) and tanned so that the fiber strength is the priority. Used in equestrian tack and outdoor working equipment, it is wonderfully tough. A chromium tanned leather similar to what Red Wing boots uses. Care Tips: Should require little conditioning due to the amount of tallow infused in this unique leather. Use conditioner to help restore the uniform surface look. Repels water and elements decently. Always avoid water and soaking as you would with any leather item. You may see us occasionally use the term "boot leather" in conversation, so this is for those of you who ask what exactly we're talking about. We really don't use this leather for much of anything at Craft and Lore, except for our EDC Valet Tray. We just refer to it as "boot leather" around the shop, since that is the what this chrome tanned leather is typically geared for. We mostly put it to work in our packs that we build with our sister brand, Folkland USA. Chromium tanned leather is a quick and efficient tanning process that produces a beautifully supple leather. It can have a slight pull up effect, such as we see in Horween's Chromexcel. It is very resistant to the elements, and wears in beautifully. Care Tips: Should require little conditioning due to the amount of tallow infused in this heavily waxed leather. Repels water and elements excellently. Use conditioner to help restore the surface appearance or to prevent slight firming after a soaking. Soaking can result in darkening and added firmness. We do love the heft of this great leather from renowned Hermann Oak down in Saint Louis. We stock this in a very heavy weight to use in our Mountain Belt, and it is available in Russet and Dark Brown. There is a great amount of variance in every hide we receive, and so rarely are any two belts alike. Expect markings of the animals life on the leather, as well as wax bloom. The belt will even out in color and become slightly more supple while being worn in. Expect it to hold it's firm hand fairly well, unless it is put under a heavier stress than a typical work belt. You can see a video comparison of the Russet color when it is new, and after a few months of wear. Rare, twice as durable and dense, and the top of the line. Care Tips: The glossy finished surface withstands much of the elements and abuse. Use Saphir Cordovan Cream (Amazon Link) on the surface for restoration and beauty, but be sure to match the color of the cream to the color of the item. Otherwise, use any quality leather conditioner to add protection and restore moisture to dry leather. For reverse Shell Cordovan items, treat the leather as you would Natural Veg Tan. It will be readily absorbent to liquid and markings which makes it excellent for patina hunters, but requires an occasional conditioning every few months for protection against moisture/dust/etc. The shell refers to the round section of a horse rump that this unique leather is derived from. The biggest a single shell can get is typically around 2.5 square feet. The hyper density of the leather has to do with a membrane in that part of the horse. It takes months to create this amazing leather and it is not cheap. "A product made of shell cordovan will last multiple lifetimes. The best part of using shell cordovan in a wallet or watch strap is the natural rubbing a wear placed on the shell which starts developing an amazing patina that develops with each use. It is similar to having a fine wine that you can drink every day and keeps getting better. - Nick Horween, All About Shell Cordovan"